Opher and colleagues detail the discovery in the Dec. 24 issue of the journal Nature. NASA's two Voyager probes have been racing out of the solar system for more than 30 years. They are now beyond the orbit of Pluto and on the verge of entering interstellar space. During the 1990s, Voyager 1 became the farthest manmade object in space. The Voyager craft, racing in opposite directions, have revealed among other things that the bubble around our solar system is squashed. "The Voyagers are not actually inside the Local Fluff," Opher said. "But they are getting close and can sense what the cloud is like as they approach it." The Fluff is held at bay just beyond the edge of the solar system by the sun's magnetic field, which is inflated by solar wind into a magnetic bubble more than 6.2 billion miles wide (10 billion km). Called the "heliosphere," this bubble protect the inner solar system from galactic cosmic rays and interstellar clouds. 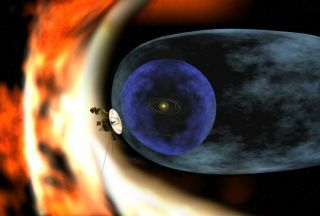 The two Voyagers are located in the outermost layer of the heliosphere, or "heliosheath," where the solar wind is slowed by the pressure of interstellar gas. Voyager 1 entered the heliosheath in December 2004. Voyager 2 followed in August 2007. These crossings provided key data for the new study. Other interstellar clouds might also be magnetized, Opher and colleagues figure. And we could eventually run into some of them. "Their strong magnetic fields could compress the heliosphere even more than it is compressed now," according to NASA. "Additional compression could allow more cosmic rays to reach the inner solar system, possibly affecting terrestrial climate and the ability of astronauts to travel safely through space."